In September 2008, I was summarily dismissed from my position as a lecturer in GCSE Maths for an adult class at Henry Cort School in Fareham. The reasons for this are not exactly clear. The reasons appear to be concerned with the issue of the intended level of the class. Nevertheless, elsewhere I have also simultaneously taught students to the Higher Level if they wanted to go to that far, achieving A* on at least one occasion. At Henry Cort, on the night I made it crystal-clear to the students that I would teach the Higher Level to those who genuinely wanted to take that exam. This dismissal was not instantaneous. On the night they had no idea what they wanted. It was left that they would ask one of the full-time 'day' teachers on the next day. So even after the course had started, they themselves had no idea what level(s) the course was suppose to follow. Yet next day, they dismissed me because I was not teaching what they 'wanted' despite not telling me what they wanted until the day after the course started! Except of course, as I have already said, I was teaching the levels that they wanted!! Why I should be dismissed for their error is not clear at all. This is not a trivial episode for me. Effectively it has taken my career off me - I now work as a pert-time postman. Originally, I was hoping to use this appointment to get back into teaching full-time but that career path has now been closed by virtue of this incident. Two months after being dismissed, I reached the last two for a job at St. Vincent's College but was told quite specifically that a lack of recent experience was the main factor against me (I obviously didn't tell them about Henry Cort). I have attempted to make my statements here as falsifiable as possible, in line with the scientific method. By falsifiable, I mean that if what I am saying is wrong then it should be easy enough to show clearly (i.e. prove) that I am wrong. Expressing my concerns with Austin at a letter date, he informed me that he was totally unaware of certain events I described and he would ring me later to discuss things further. He never did ring me. AND BELIEVE ME - I HAVE TRIED AND TRIED AND TRIED TO GET AUSTIN TO GIVE ME AN EXPLANATION (needless to say the bit about a meeting during which an explanation was imparted orally is completely untrue). I think what happened was this : a few students went to the office to verify that the higher level topics would be taught (this is not unexpected - this is exactly what happened when I worked at Bridgemary School). They possibly stated if the higher level topics were not to be taught then they would have to find somewhere else to study, or something similar. By the time this 'information' reaches Austin (who was not there on the night in question) this had been transformed into the quote above (compare : send three and fourpence, we are going to a dance). Just to ram this message home. This is mathematics we are talking about - it is essential that all students know the basics before proceeding further, otherwise you are just asking for trouble. There were no students who appeared to know the material presented in the lesson, inside out. I most certainly am not going to take anyone's word as to their prior understanding either. Any divergence between the two levels can develop as the course progresses, not during the first lesson. And it was obvious that at least 50% of the students did find the material presented in the first lesson to be challenging. I worked at Henry Cort up until December 2008. 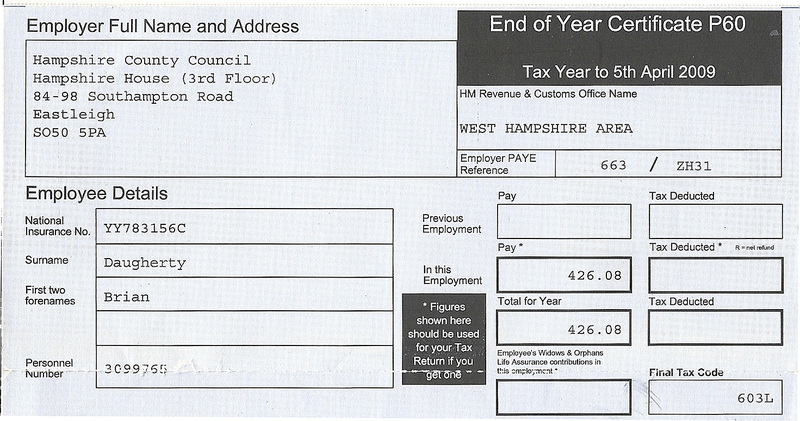 This is my P60 issued at the end of the tax year in April 2009, showing my earnings in that tax year to be £ 426.08. This is wrong on every count. Their own figure of 564.30 is wrong, and the figure they quote from me of 496.60 is wrong. The only way that the figure of £ 426.08 on the P60 could be increased would have been due to payments issued after April 2009, over 3 months after I had ceased working for Henry Cort. Such payments would have been easy to trace and identify. The crucial thing is this - I tell Austin et al. that £ 426.08 is less than £ 564.30 and I might as well talk to the wall. And this is a person working as a teacher in a school, for Christ's sake! Because they were unconvinced that 426.08 is less than £ 564.30, the issue had to go the County Court, where Austin et al. obviously lost. Austin turned up at the court in Portsmouth along with Havlin from the County Council. They presented no evidence, so it was a waste of time them turning up. But I presume they both would have claimed expenses etc. They most certainly had to pay court costs. At one point Havlin had even decided that I had been overpaid by £ 400. And Austin asked me : "What would convince you that you had been paid"? I am a Mathematics teacher and here I am being led a merry chase by a couple of people who can't even carry out some basic arithmetic. However, because they had lost by virtue of offering no evidence, they decided that they would turn around and say : "Now no-one knows whether you are entitled to this money or not". The last paragraph might appear humorous but it is essential that I get recognition that I am entitled to this money. I have not having it down on my record that I am some chancer who managed to 'con' the Council out of money that I am not entitled to. Furtermore when I received a cheque from the Council, it was not for the sum I was entitled to (about 40 pounds or so) but for £ 65. I assume this £ 65 is the same £ 65 by which they said they had overpaid me (see County Court Document). I have not cashed the cheque for £ 65 because, as I say, it is too high. Any admission from the Council that I am actually entitled to the money that I am seeking would presumably inevitably show that this £ 65 is indeed too much. It would not reflect too well on me if I had actually cashed the cheque in the meantime. I used to work in the Salaries and Wages Office of Liverpool City Council, so I know that in my time problems of this type would have been settled once and for all within 5 minutes, at the outside. Nowadays, with computers, the time required would be even less. I must admit that when I told the Council that they had given me too much money, I would have expected a more pronounced response then the apathy I have in fact experienced. I did also approach Councillor Roger Price from Fareham. This hasn't produced anything fruitful.